It is slowly dawning on me that only 2 weeks of my summer remain. As amazing a learning experience it has been, I am more than eager to return back to the midwest, where things are admittedly simpler and slower, because at this rate I’m starting to forget what it feels like to take a break and truly relax. In anticipation of this, I noticed I’ve been incorporating bits and pieces of home into my life here in Providence. I turn on NPR, and instantly I am taken back to car rides with my father in the mornings on the way to school; on Saturday afternoons I put on ‘Wait, Wait, Don’t Tell Me!’ not only because I adore Peter Sagal, but also because it reminds me of spontaneous weekend trips out to lunch. I even felt a twinge of homesickness the other day when I heard an old couple speaking Chinese on the bus. Food always has that component of nostalgia (remember Anton Ego in Ratatouille?). Take this garlic shrimp, for instance. 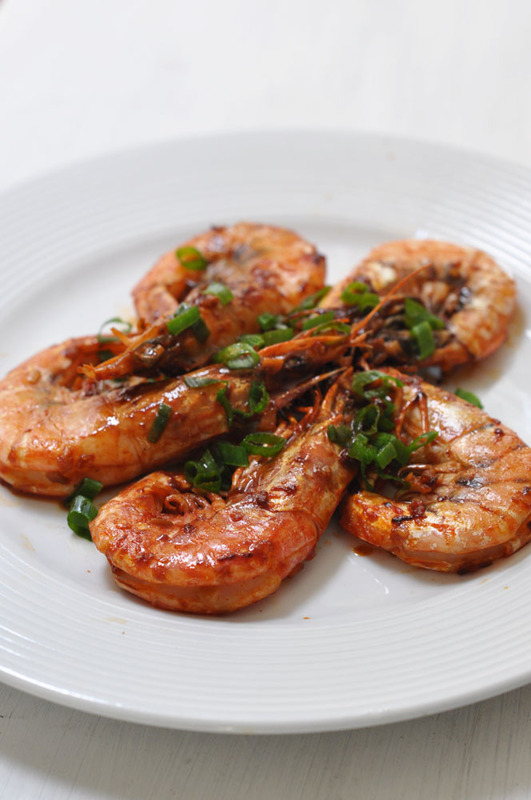 One of my mother’s frequent meals at home is a plate of large tiger prawns, sauteed in fragrant garlic, ginger, and a bit of soy sauce. When I went to Whole Foods I had no intention of making this dish at all, but the friendly Whole Foods fish guy convinced me to try out these crustaceans. As I was contemplating the unexpected purchase, I thought I’d try to recreate her recipe, but then I decided I’d include a bit of a twist inspired by my own experiences. I decided to add a spoonful of Korean red pepper paste (고추장, or gochujang), a condiment that has become one of my favorites after a trip to Korea last summer. We rarely eat anything spicy at home because my father and brother’s palates can’t tolerate any degree of it, but an expedition last summer to Korea and Southern China has definitely adapted mine (I kept a short travel diary here). Balanced with honey, the flavor combination worked out perfectly. I’ve never really handled whole shrimp before, but I love a challenge; deveining turned out not to be that bad (just be gentle!). Interestingly enough, my entire life when I would eat prawns at home I would be completely grossed out by my parents eating the portion inside the head, but after making them myself… There’s just something about lovingly and painstakingly preparing and cooking the shrimp (or any food, for that matter) that makes you not want to waste any of it. Plus, I learned how absolutely awesome that portion is: all the flavor is concentrated there! Ultimately, this was precisely what I needed, what I envisioned: flavors of home, with a kick of my own. It was entirely satisfying and delicious. 1. Wash shrimp and pat dry. Devein, leaving heads on. 2. Turn pan on to medium low, and heat olive oil. Add garlic and saute until fragrant. Add shrimp to pan and stir to coat. 3. Add soy sauce and red pepper paste to pan and stir. 3. 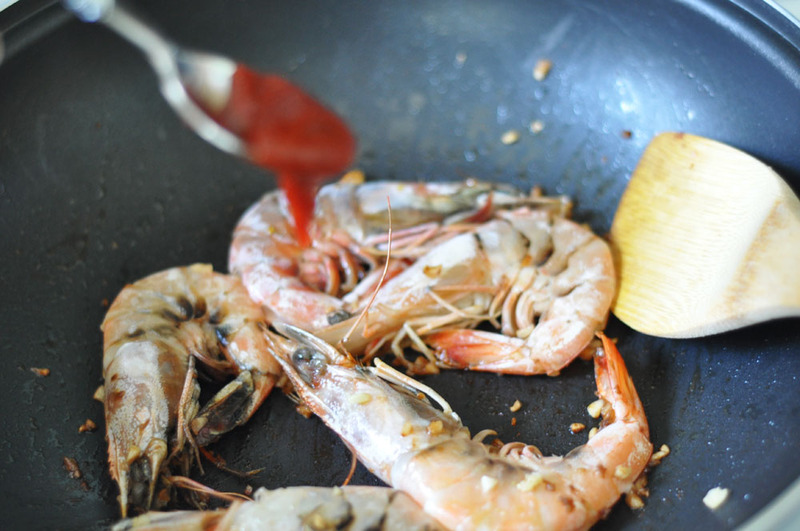 Once the shrimp are almost fully cooked, deglaze the pan with wine or stock (trust me, you will want to deglaze this pan well. The shrimp essence is wonderful). Add honey to taste, and simmer until done. 4. Plate. Pour sauce on top, sprinkle with green onions, and serve. Eat as messily as you like. by the way. you’re really awesome. if this were Facebook, I would like Sean’s comment. I just KNEW that someone would have a recipe for Korean red pepper paste and shrimp. Thank you.